You know you need to get 5 star reviews on Google, Facebook, Yelp and other platforms but it has always been a pain to get customers to leave them. Right? What if there was a solution that is fast, immediate and easy to use for you and your customers? If your potential customers are looking online for a product or service and see a company that gets 20, 30, 40 or even 100+ 5 star reviews, and your competitor has 2 or 3, that potential customer is going to contact you and already have a high trust in your business’ quality of product or service. Once customers do contact you, you are going to be able to close them with much less effort, because they have already seen how much social trust others have in your business. You can also point them to these reviews in your sales process. Google and other sites make no secret about it. 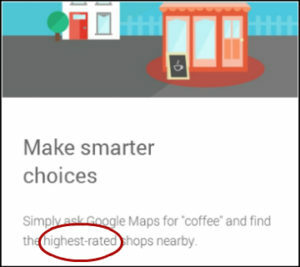 High ratings on your reviews impact your search results… how high up you appear in the search rankings. 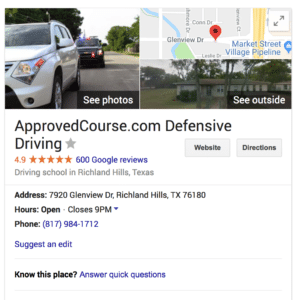 In fact, SEO expert Bruce Clay highly recommends spending time getting five star reviews for your business online if you want to climb the ranks in search results. Yelp searches, Facebook searches and other searches provide higher ranking to profiles with a solid volume of high reviews. But how do I get 5 Star Reviews without pulling out my hair? Until recently, getting good reviews meant sending a customer an email or putting a badge on your site that you hoped your customer would notice, and then go through the laborious process of remembering to leave the review, finding the email, clicking through, logging in, and writing a review. No longer is that necessary due to a TOP SECRET platform that has just hit the market. It is created and designed by a personal friend of ours, Troy Cole, we have tested it and LOVE it. It makes leaving a review as easy as THREE CLICKS! And because the review request arrives via text message, it’s more apt to not be ignored, because we all look at our texts faster than almost anything else on our phones. 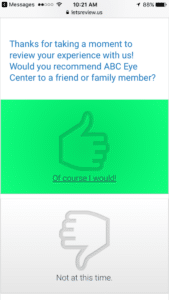 THREE CLICKS…that makes getting 5 star reviews SUPER simple for you and your customer. 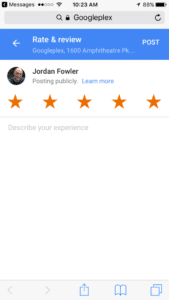 How does this five-star review grabbing platform work? Let’s do a simple screenshot walkthrough so you can see how easy it is to get 5 Star Reviews. You or an employee simply go to your company’s ReviewGrab page (Shhh! That’s the name of the platform). Cut and paste or type in a phone number and the first name of a customer. Hit the “Send Me a Request” button. Boom! Your review request is on its way. They get a text message. 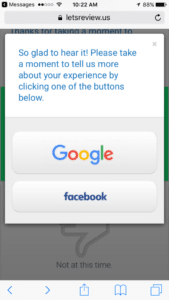 Note, you control which review site buttons appear. You can do one button or multiples. We like our clients to rotate them monthly to spread the review goodness all around the web. THAT’S HOW YOU GET 5 STAR REVIEWS!!! 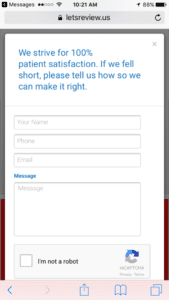 In the rare event your customer wasn’t happy, the thumbs-down selector takes them to a private e-form that gets emailed to you where you can address their concerns directly rather than having a bad review floating around online. Someone is going to win the review game in your niche. Whoever does will get miles ahead, gaining hot leads and more easily converting them. You are busy and you need an EASY solution to get 5 star reviews consistently. This brand new platform is working wonders for clients. Because Troy Cole, the founder of this amazing little platform is a personal friend of ours, we are able to provide you this AMAZING little 5 Star ReviewGrab at a discounted rate. Do you have proof this method to get reviews really works? Approved Course is an excellent online defensive driving course and Moon & Owl client. Before ReviewGrab they had 4, yes 4 five-star reviews. In just three months they jumped to 285 Rating Value: 5 -star reviews. In one year? 600+ 5 star reviews. Want a FREE demo text to try it yourself? Just enter your first name and cell phone below. 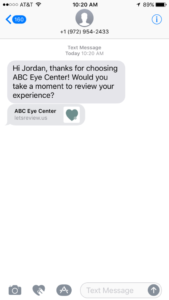 We’ll send you one free ReviewGrab demo text and nothing else. 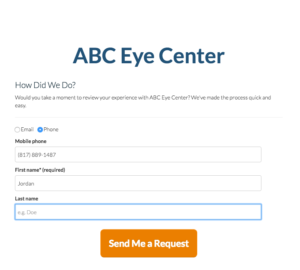 You’ll get a request from ABC Eye and you can see just how easy leaving a review is. We don't store your number or text again, ever. 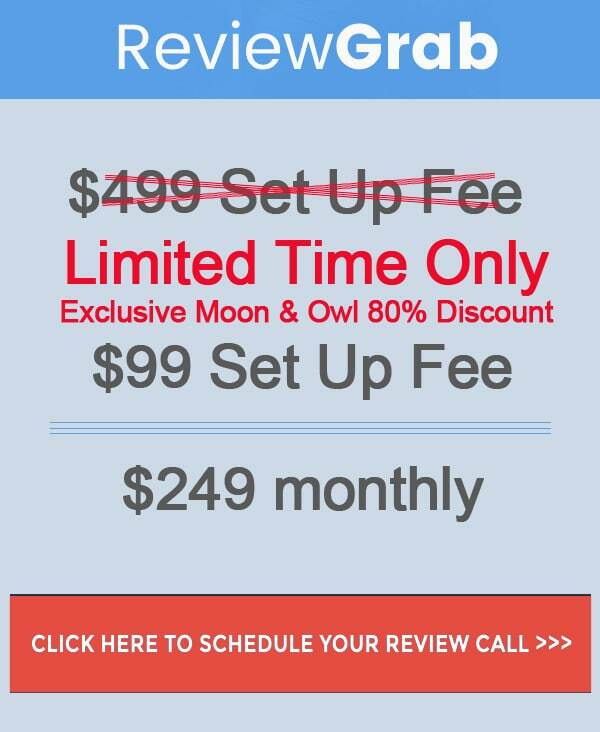 Normally the ReviewGrabber service is $499 for a set-up fee and then a $245 monthly service fee. That in itself is a great deal for starting to collect valuable 5 star reviews! But because you are going through Moon & Owl Marketing, and Troy is a big fan, we have a special promotion he is offering Moon & Owl referrals for a LIMITED TIME. The full price will be your only option soon. Make SURE you tell him Moon & Owl sent you for your HUGE discount!